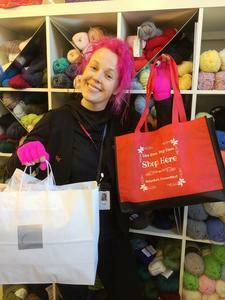 The Set Decorator for an upcoming FX series about Bob Fosse and Gwen Verdon recently came to nancy O looking for “unfinished knitting and crochet projects” to place on the set of the show. The reason? Many dancers knit while waiting for rehearsals and performances. The nancy O staff sprang into action, finding abandoned projects and old knitting needles for the set. When offered compensation, the team unanimously agreed that the money should be donated to The Prospector Theater, and it was. While the 8-part FX series has not been titled, and the release date has not been announced, watch for an exciting show with some big names. One of the Executive Producers is Lin-Manual Miranda of Hamilton fame, and it will star Michelle Williams and Sam Rockwell. The knitted work “laying around the dressing room” is from nancy O! You can read about the upcoming show in Town & Country Magazine here.